Beautiful Home - Not your everyday new home! How about hardwoods throughout the ENTIRE home including inlays in the entrance hall and dining made from six different exotic woods! Or gourgeous cherry kitchen cabinets that were hand made by Amish carpenters from northern MO. They are stunning and include a custom oversized matching wood vent hood with hidden spice drawer pullouts. There's a formal living room that has glass french doors which allow you to use it as an optional study. A dining room w/ wainscotting, extra deep crown moldings and 6 piece window and door trim throughout. All the bath cabinetry is also hand made cherry with granite counters throughout. There are two covered porches (front and rear), a huge light filled upstairs hallway, an Italian commerical 36 range, walk-in pantry, butler's pantry and built in bookshelves. 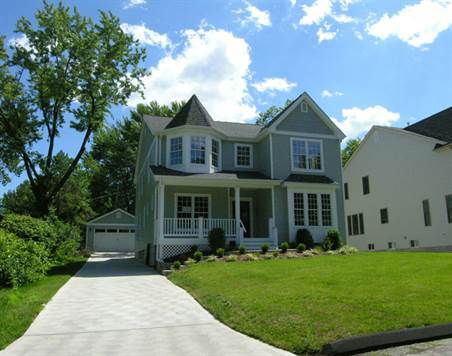 This is a home that is truly heads and tails above other new construction in the area! View the attached floor plan and feature sheet for more details. Photos will be posted June 1st.